Snow cover forms when water vapor condenses into ice crystals, falls from clouds and sits on the ground surface. Snow is made up of ice crystals that grow around tiny cloud particles of airborne bacteria and dust called ice nucleators. In clouds these ice crystals aggregate together to form snowflakes - the fluffy, light material that floats from the sky and dampens all noise. If the ground temperature is cold snowflakes “stick” to produce the blanket of snow that remains on the ground until it melts or sublimes. In cold climates snow persists all winter and where it also remains cold in summer the snow does not all melt at all, accumulates and forms glaciers that under climate change become melting glaciers . Because temperature, precipitation and wind determine the accumulation, melting and wind erosion of snow, trends in the amount and extent of snow cover change from year to year is a useful indicator of climate change. There is also a climate feedback mechanism associated with snow due to the albedo effect - the extent to which snow reflects light from the Sun. The albedo of snow is often 80% or more, this means that much of the incident radiation is reflected and with it warmth. So a cover of snow tends to keep things cool. However, if an area warms and the snow melts, the albedo is lowered, less heat is reflected and more snow melts – this is the ice-albedo positive feedback and can be a significant factor in local climate and snow melt. Snow is, of course, just frozen water. New snow commonly has a density of between 5% and 15% of water but this varies from place to place and with the physical processes in the cloud that affect the shape of individual snow crystals. Snowflakes with many branches have more space between the arms of ice. This snow has a lower density and is often referred to as ‘dry’ snow. Snowflakes with fewer branches are denser and ‘wetter’. Snowmelt creates pulses of fresh water into streams and rivers that in many northern latitudes is a critical driver of ecosystem processes. 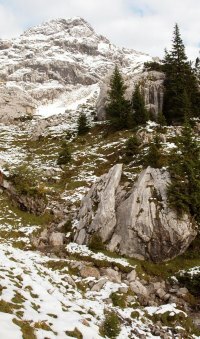 Melting of mountain snowfields is also critical water supply to many communities around the world. For example, the hydrology of most Canadian river basins is dominated by seasonal storage of water in snow cover. More than 80% of total runoff to semi-arid regions such as the prairies and interior valleys of British Columbia come from snowmelt. In the Himalayas this water supply issue has also been confounded where meltwater has created large lakes held back by rockslides. These natural dams will inevitably burst, endangering anyone living in the valleys below. The World Wildlife Fund calculates there are 2,000 glacial lakes forming in Nepal and around 20 are in danger of bursting. The effects of climate change on snow cover are typical of global warming effects in general. They are never simple. These characteristics make it very difficult to understand the consequences of climate change and almost impossible to predict the outcomes for human and natural systems. And it is why we worry about it all.